Tehran (AFP) – If the US was hoping renewed sanctions on Iran would cause immediate economic turmoil and mass anti-government protests, it may be disappointed, though real pain could still be on the horizon. US President Donald Trump described the embargoes that returned on Tuesday as “the most biting sanctions ever imposed”. AFP / ATTA KENARE. A man exchanges Iranian rials for dollars at a money changer in Tehran on August 8, 2018. That was already an exaggeration since they only reimposed measures that were in place before the 2015 nuclear deal which he abandoned in May. His national security advisor, John Bolton, said Iran’s leaders were already “on very shaky ground” after days of protests across the country against high prices and the lack of political reform. 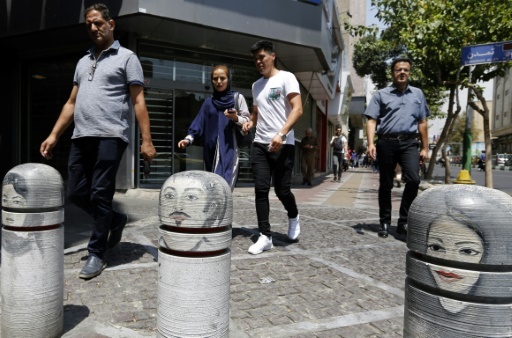 But while there is plenty of despair in Iran over the state of the economy, and fear for the future, the return of sanctions were marked by relative calm. A large-scale security deployment and mobile internet blackouts certainly played a role, and getting a clear picture of the situation outside Tehran is almost impossible due to heavy reporting restrictions. But the chatter on social media indicated at least a lull in the protests, while analysts said the idea that economic pain could lead to a full-blown revolution was far-fetched. “Western observers are often quick to erroneously assume that localised demonstrations… are wholesale rejections of the Islamic republic,” said Henry Rome of the Eurasia Group in a briefing note. 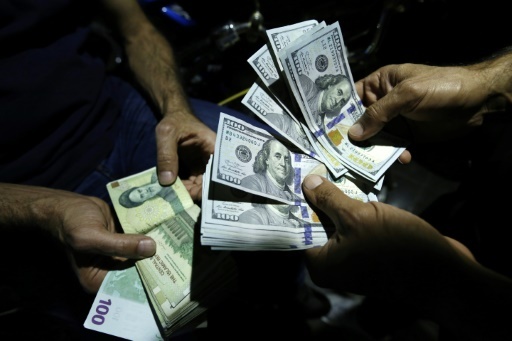 Moreover, there was actually some good economic news this week for once, with the rial gaining more than 20 percent since Sunday in response to new foreign exchange policies announced by the government. AFP / ATTA KENARE. 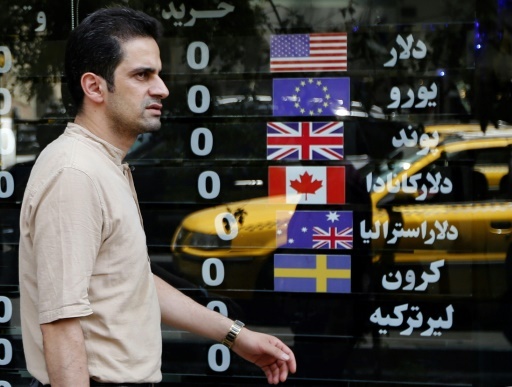 An Iranian man walks in front of a currency exchange shop in Tehran on August 8, 2018. That points to the fact that Iran’s problems are driven at least as much by internal dynamics as US pressure. Trump’s aggressive rhetoric certainly helped fuel the run on the rial, which has lost half its value since April. “The government was late in its decision-making, but it is the right move,” said Mohammad Reza Najafi Manesh, head of the business commission of the Tehran chamber of commerce. He said sanctions were secondary to dealing with Iran’s internal problems, and his chamber was in meetings with the government on Wednesday pushing for additional support such as subsidised imports of raw materials. “It’s not our first time dealing with sanctions. We know how to search for solutions, and we will do our best to meet our needs locally,” said Najafi Manesh. There are real losses from the sanctions. Big European firms like Total, Siemens and Peugeot have already pulled out before their investments could bear fruit. “November is when the hammer drops: A serious chunk of oil export revenue will evaporate, and Iranian banks will likely find themselves cut loose from much of the international banking system,” Rome said, adding that Eurasia Group expected Iran to lose sales of 700,000 barrels of oil per day. Parliament has summoned him to demand answers, and on Wednesday impeached his labour minister Ali Rabiei. “The economic section of Rouhani’s team is the weakest part of the government. Everyone knows this, but he never changed his direction because they are his allies,” said Mohammad Reza Behzadian, a former head of the chamber of commerce. Figures collated by economist Faezeh Foroutan, and published by analyst James Dorsey, showed China alone accounted for 25.6 percent of Iran’s imports and 19.7 percent of its exports since March — more than all European countries combined. China, India and Turkey have already said they will not significantly cut their oil purchases from Iran. Tehran hopes that Trump lacks the international goodwill enjoyed by his predecessor Barack Obama to make sanctions stick. “There is a big difference this time: before nobody supported Iran. But now, all the countries in the world are supporting Iran,” Foreign Minister Mohammad Javad Zarif told reporters on Wednesday. Featured Photo: AFP / ATTA KENARE. Iranians walk along a street in the capital Tehran on August 8, 2018.